Anyone searching for an electric skateboard that provides a long range at an unbeatable low price may be interested in a new product which is being launched via Kickstarter this week in the form of the Longrunner LongRange Electric Skateboard. Priced at just $99 for early bird backers the new electric skateboard is hoping to start shipping worldwide during June 2017 and has alternative pledges available priced at €149 and €199 if you not quick enough to grab the $99 price tag. 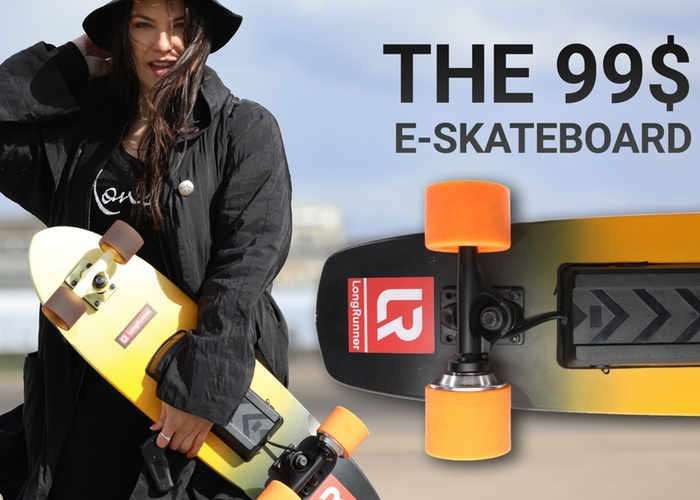 Watch the video below to learn more about the high-powered electric skateboard which has been designed by LongRunner based in Berlin Germany. We looked at at buying an E Board but at a minimum of 300 to 500 Dollars, simply way out of our range, so we decided to see if we could build one less expensive for ourselves. After two years and two trips around the globe searching for the perfect solution, we have now it! Presenting our masterpiece, the first truly affordable E Board: LongRunner – the Long-Range Low-Price eSkateboard! We are so excited to have been able to source the most affordable parts and in our workings with designers and engineers from Asia, Europe and USA, we have an excellent design that is simple, functional but most of all; long lasting and very cool. We hand assemble every skateboard and have it tested for functionality, nothing is more important than the durability and reliability, with LongRunner you get both and it looks great! High-Quality Cast-Axis and PU Powerwheels with maintenance-free ball bearings. The Ultra High-Efficiency Brushless DC Hub Motor together with the High-Voltage 29,4V Battery guarantee a long range and fast riding experience. For more information on the new Longrunner LongRange E-Skateboard jump over to the Kickstarter website for details by following the link below.